The rate reduction from 52 to 42 on the 737 line in Renton will be done without layoffs, SPEEA was informed by the company on Friday. SPEEA will monitor the reduction and its impacts on SPEEA-represented employees at Boeing and where we represent employees at suppliers. 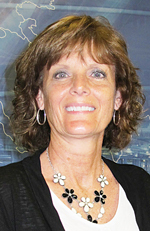 WICHITA – The Midwest Council voted April 11 to select Area Rep Ronda Cockrell for the interim SPEEA-area IFPTE vice president. Joel Funfar and Ryan Rule. Cockrell is active on the Midwest Legislative and Public Affairs Committee, secretary for the Central States IFPTE and was a delegate to the 2018 IFPTE convention. The Northwest Council invites members involved in outreach related to Science, Technology, Engineering and/or Math (STEM) to apply for a STEM grant. The NW Council STEM grants are for non-profit organizations or institutions, with at least one Northwest SPEEA member participating (as a coach, mentor or parent) in Washington state, Oregon, California and Utah. SPEEA is looking for members to apply for the NW Council STEM grant review committee. The committee meets to review grant applications and make funding recommendations to the NW Council, which votes on the grant allocations. If you’re interested in the committee, email your name, school district to NW_STEM_grants@speea.org by noon, Monday, July 1. A total of 91 members submitted valid petitions for SPEEA Council Rep seats. Of those, 54 ran unopposed in the Northwest and eight ran unopposed in the Midwest for two-year terms to serve as their district’s Council Rep.
A total of 36 seats remain vacant. Click here for the Council Rep petition results. SPEEA will hold a total of 10 elections in contested districts. The ballots will be mailed to members’ homes in those districts along with candidates’ statements by April 10. Ballots will be counted April 24. All Council Reps begin new two-year terms May 9. Candidates and their supporters can conduct campaigns, but federal law prohibits the use of company or union resources. This includes company email, copy machines and bulletin boards. Interested in serving your co-workers as their union representative if your district has a vacancy? For the instructions, petition and district delineation, click here. Submit your petition and statement to terryh@speea.org by May 7. Extensive training is provided to Council Reps along with ongoing support from SPEEA contract administrators and other staff. Attendees at the SPEEA Northwest Regional awards banquet on Saturday with IFPTE President Paul Shearon, center, include past presidents, from left, Tom McCarty, Craig Buckham, Shearon, current President Joel Funfar and past president Ryan Rule. SEATAC, Wash. - At the Northwest Recognition Banquet, SPEEA recognized the activists who make the union strong. Several awards were presented for lifetime achievement, as well as outstanding leader, contributor, activist and more. Northwest Council Chair Tony Hickerson emceed the event, with help presenting awards from fellow NW Council officers, James Raskob (treasurer) and Douglas Brazeal (secretary). SPEEA President Joel Funfar introduced IFPTE President Paul Shearon, the banquet guest speaker. The Northwest Legislative and Public Affairs Committee chose U.S. Rep. Derek Kilmer for this year’s ‘Friend of SPEEA’ award for being an advocate for working people’s issues. SPEEA Treasurer Jimmie Mathis, who has represented SPEEA in many meetings with Rep. Kilmer, presented the award. Among the honorees were Craig Buckham, former SPEEA president during the membership vote to affiliate with IFPTE in 1999 and the SPEEA 40-day strike of 2000. Buckham recently retired from The Boeing Company. Congratulations to the 2019 Northwest Council Recognition Award recipients! SPEEA Northwest Tellers certified election results after counting. Shown here are Tellers Saher Ahmad and Michael Knopp. Members elected Dan Nowlin, Mike Shea and Daniel Peters to serve as Northwest regional vice presidents on the Executive Board. The names in bold are the top vote getters. In the Midwest, Keith Covert is serving another term as Midwest regional vice president. A total of 1,369 valid ballots were received out of a total of 16,710. Northwest Tellers validated ballots and certified results March 13. The new two-year terms begin March 27 for all four regional vice presidents. The seven-member board typically meets twice a month and provides oversight to SPEEA activities and expenses in addition to serving as the interim negotiations team, as needed. * In review of election results announced for the Northwest Vice Presidents election, an error was found that resulted in the incorrect tally being listed for one unsuccessful candidate. There is no change to the winning candidates but one losing candidate moved from 8th place to 6th place after correcting the error. After reaching out to SPEEA for assistance, employees at Boeing's Seal Beach site in Southern California launched an organizing effort to gain a stronger voice in the issues that impact them at work. Still in its early stages, the group adopted the name California Region Engineers And Technical Employees (CREATE) and is working to gain support in the workplace. Facing changes that require working four hours for free before being paid for overtime, rising costs of health care and continued outsourcing of their work, Seal Beach employees realize the need for a stronger voice in the issues that impact their lives and careers. Learn more about the effort by visiting the www.create-speea.org. OLYMPIA – Investments in education and workforce training programs suggested by Choose Washington, NMA are included in the state budget proposed by Gov. Jay Inslee. $22 million to increase enrollment in K-12 and Community and Technical College programs. $18 million for facility and equipment upgrades. $16 million for incumbent worker training including the Washington Aerospace Training & Research (WATR) Center. $7 million for system implementation to help ensure higher education credits transfer across institutions, as well as expanding aerospace programs. SPEEA advocates that placing design and engineering with our members – wherever they are located – offers the best chance for a successful launch of the NMA. During a recent meeting with Spirit President and CEO Tom Gentile in Wichita, members inquired about Spirit’s efforts to secure some of the work and were assured the company will work to win and secure work going to suppliers. 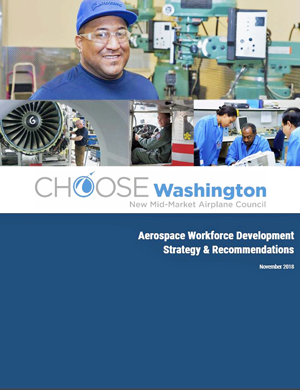 The Choose Washington Workforce Development Strategy is the most comprehensive assessment of current investments in the state’s aerospace workforce. It includes strategies for ensuring Washington’s education and workforce training is scaled to meet the need, and is coordinated, integrated and accountable. Work continues with the Council in multiple areas with SPEEA staff members Stan Sorscher on the Executive Council and Bill Dugovich on the communications work group. Dugovich recently was part of a Choose Washington panel that appeared on KBTC public television’s Northwest Now. Subscribe to email news and updates from the governor’s Choose Washington NMA Council. Visit the Choose Washington, NMA website.